This 20 pocket A4 display book allows you to display and protect up to 40 pages. Easily carried in bags, cases and rucksacks, this folder also features a full-length label along the spine for indexing and personalisation. Inside, the clear pockets are designed not to lift off print. 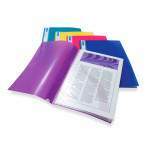 The cover is made from translucent polypropylene in bright aqua, blue, lime, ruby and purple. There are 10 books per pack.